The Midland Grand Hotel was at the cutting edge of building technology when it was constructed. The builders contracted to carry out the work were Jackson & Shaw. It incorporates an iron framework and Morelands patented fireproof flooring system. Internal walls up to four feet thick were made of brick and covered in lime plaster. 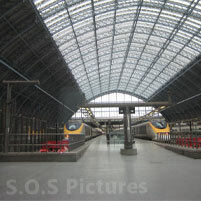 The Morelands system was not unique to St. Pancras, there were many other similar systems in use, but they all worked on the same principle: Iron 'I' beams formed the framework of the building, riveted together. Between these I-beams were placed smaller beams which were fabricated with the lower side flat, the upper side arched. On top of these arched beams was laid corrugated iron sheeting, overlapped. Then a rough lime concrete was poured on top of the corrugated iron, to a depth depending on the size what the room was to be used for. The top surface was then battened with timber and finally laid with 1¼” (30mm) mainly pine floorboards. The lower surface was battened, lathed and plastered with lime plaster. The idea was that should a fire occur, it would be held back by the iron and concrete, and should the iron distort, the concrete would still hold up due to having set in an arched shape and embedded into the I-beam. The ceilings were then decorated with cornicing and lighting rose, ready for painting. The walls were lime-plastered and finished with plaster skirtings. 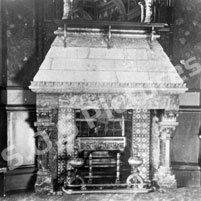 Fireplaces were ornate marble in the principle rooms and stone elsewhere. All staircases were cantilevered out from the walls with the exception of the spiral staircase in the original entrance hall (now the Chambers Club). All these staircases are made of stone, landings are supported with ironwork, on the public staircases very ornate ironwork, except on the Grand staircase. Here the landings are supported by ironwork, but it is concealed under a confection of fine fibrous plaster, designed to give the illusion of timber. The illusion is carried on under the stairs themselves except at second floor to third floor where the stair is seen to be somehow floating – the cantilever doing the work. The newel posts on this staircase incorporated a gas pipe which carried the supply to beautiful ornate gasoliers manufactured by Francis Alfred Skidmore, as was all the ornate ironwork. These gasoliers were converted to electric operation between 1885 and 1889. 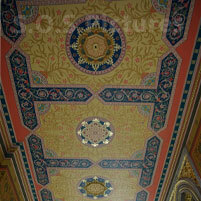 The vaulted ceiling over the grand staircase comes down to nine panels. It is not recorded how Scott intended this ceiling to be decorated. Stonework carved by masons of the firm Farmer & Brindley adorns this staircase. Small flues were incorporated into the internal walls of some of the principle rooms, to ventilate the rooms from the effects of smoke. 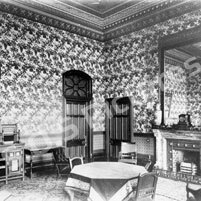 In the coffee room on the ground floor this was supplemented with a large steel flue running the height of the building in the corridors – on the first floor it was surrounded with beautiful linenfold panelling provided with two small doors. Inside these doors there were access panels to gas jets, which could be lit to cause convection. The kitchens and laundry were the most modern and efficient in Europe, supplied by Clement Jeakes of Great Russel Street. Lifts were supplied by Sir William Armstrong for both passengers and luggage. The first of these was mechanical, using a water-powered system called the 'jigger principle'. After several mishaps, this was changed to be powered by a direct-acting piston under the carriage. 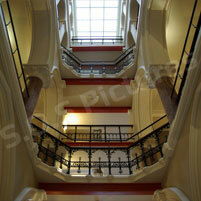 This octagonal lift could be entered from either the station or the lobby via folding gates. It was operated by a driver and egress was only on the south side. It ran to the fifth floor, stopping at all guest levels. The shaft had gas supplementary lighting, but was naturally lit with a roof-lantern to the shaft and glazed panels to the north wall of the shaft which was backed by the shaft for the luggage lift, and this shaft was also glazed to allow light from the train shed to enter. Scott was very clever in his use of natural light throughout the building. On the first floor he incorporated 'borrowed lights'- windows at height – let in to the corridor walls allowing natural light to pass through the south windows and through the borrowed light to the corridor. At the eastern end of each corridor were large full-height windows. On the fifth floor there are roof lights the entire length, shaped to capture the light rising in the east. All the rooms and public areas had gasoliers. The guest rooms on the first three floors and the public rooms throughout were fitted with electric bells. By pressing a button near the fireplace, a bell rang in the service room on that floor, summoning a member of staff. These service rooms were also fitted with a dumb-waiter and a tube for orders to be dropped down to the kitchens. Elsewhere there were chutes for soiled linen and also for cinders. Bathrooms were few, and on the corridors. They were lined with ceramic tiles by Minton and had their own fireplace. The usual way to take a bath was to have it brought to your room. 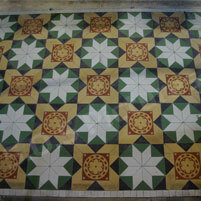 Toilet facilities were also on the corridors, again lined with tiles by Minton and with a fireplace. But all the bedrooms had their own facilities in the form of commodes and pots. 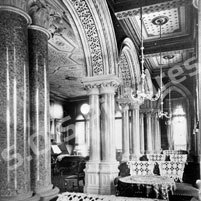 The original terrace entrance became a splendid coffee room and had beautiful granite columns, ornate timberwork and etched glass panels. A timber spiral staircase leads gently up one flight to what were the original public rooms: A richly decorated corridor with steam radiators by Haden, covered in richly-carved covers; Cast-iron and glass fanlights to the rooms; Dining room overlooking the booking office and with a view into the station; Large coffee room with ornate columns and ironwork bisecting it, matching fireplaces on either side and lovely views onto Euston Road; There is also a balcony along the entire frontage of the building; The private billiard room; Sitting rooms. All rooms were furnished by Gillows and decorated by Friedrick Sang. The hierarchy of the rooms was signified by the ceiling height. On the ground or platform level it is a maximum 24'6” (7.46m); First floor 18' (5.48m); Second floor 16' (4.87m); Third floor 14' (4.26m); Fourth floor 10' (3.04m); Fifth floor 8' (2.43m). The higher you went, the less natural light was in the rooms. Furnishings and fittings were also of a lesser quality the higher you were in the building. When the Western portion of the building opened, the entrance on Euston Road became the main entrance. This was about a year after the initial opening on May the 5th 1873. 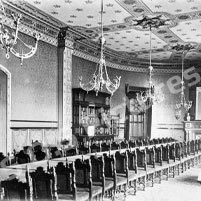 In this wing was the Entrance Hall (now the Gilbert Scott Bar); The Coffee Room (now the Gilbert Scott Restaurant); The Typing office; Public toilets; New hydraulic lift; Private dining room; Gentlemen's smoking room; Ladies reading room; Music room; Hairdresser; Timekeepers office; Stewards room; Staff bedrooms; Public billiard room; Turkish bath room and many bedrooms.